FACT CHECK: Did President Trump Fist-Pump at a 9/11 Memorial? 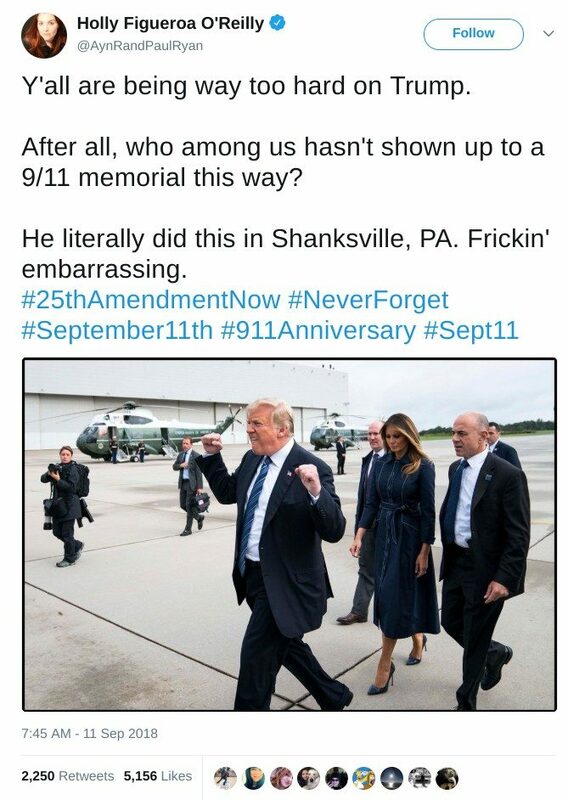 An image showing President Trump making an excited hand gesture on 11 September 2018 is genuine, but the photograph was snapped at an airport, not at a 9/11 memorial. A photograph shows President Trump making a "fist-pumping" hand gesture at a memorial for 9/11 victims. A photograph shows President Trump making an excited hand gesture on 11 September 2018. 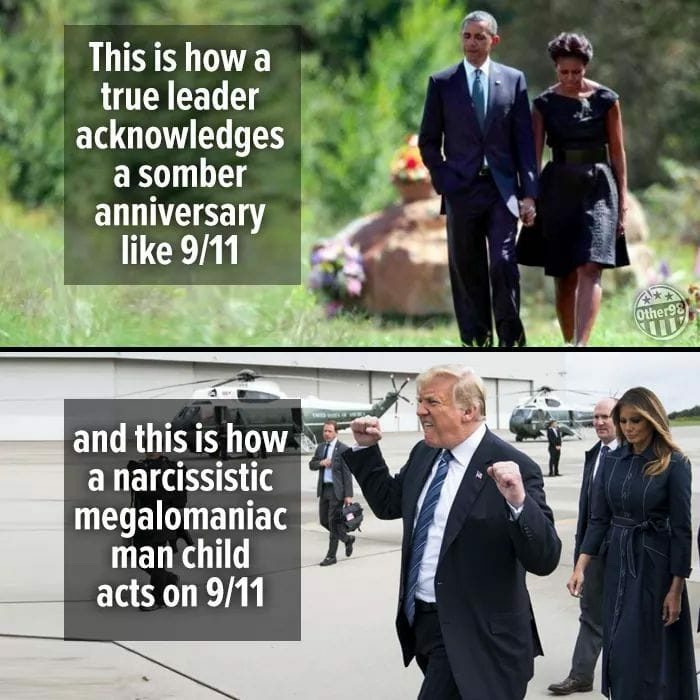 This photograph was taken as President Trump greeted a crowd of supporters at an airport; not at a memorial for the victims of the September 11 terrorist attacks. This photograph is real and it was taken on the 17th anniversary of the 11 September 2001 terrorist attacks. However, it was not taken at a memorial event in Shanksville. 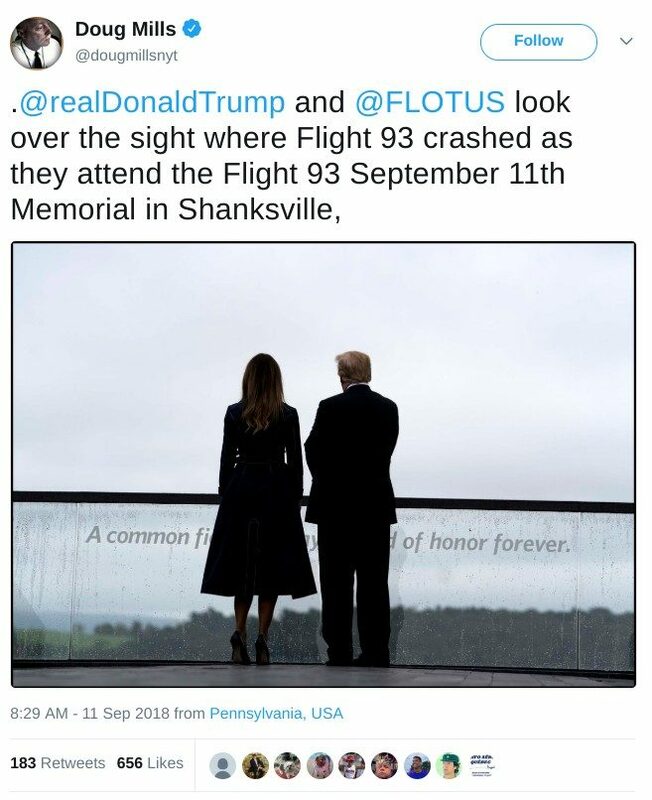 This image was also shared with the claim that it showed President Trump “on his way to a 9/11 memorial.” While this may be technically true, it should be noted that Shanksville, where United Airlines Flight 93 crashed, is about a 30-minute drive from Johnstown. The image of President Obama and First Lady Michelle was taken by Associated Press photographer Pablo Martinez Monsivais during their Obamas’ visit to the Flight 93 National Memorial on 11 September 2011, the 10th anniversay of the 9/11 attacks. So although both of these photographs may be real, their juxtaposition is misleading. 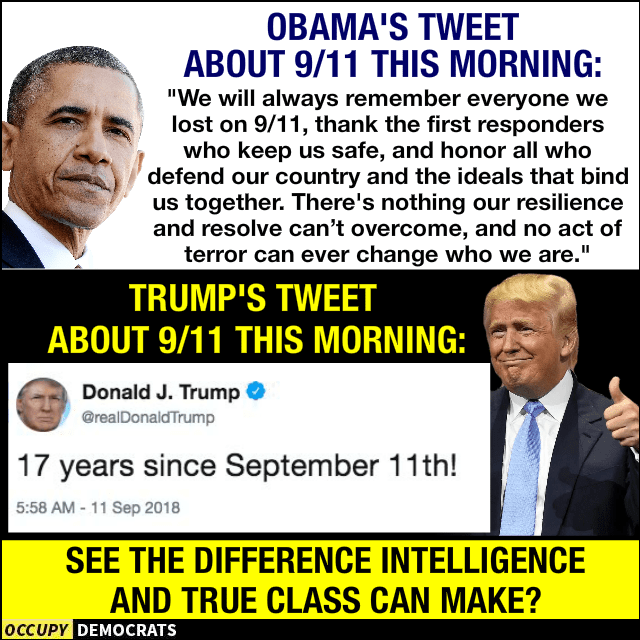 Both of these tweets are real. Again, however, some cherry-picking is at play. The photograph of President Trump fist-pumping on 11 September 2018 is real. However, this photograph was taken upon his arrival at an airport, not at a memorial service, and shows the president greeting a group of an excited supporters. Hollywood Life. 11 September 2018. The Huffington Post. 12 September 2018. The Cut. 11 September 2018.